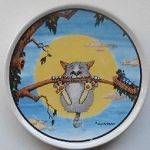 Here is a little kitten swinging a gold club. 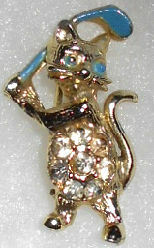 The gold tone pin is highlighted with blue enamel on the kitten's eyes and the gold club. The pin is only 1 1/8" high x 1/2" wide. Previously owned but in good condition.